The Rayford Road widening and overpass project remains on schedule for completion in 2019. 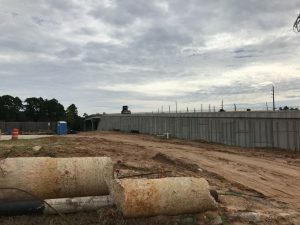 Progress has been steady, despite the fact that there have been 138 days with recorded rainfall totaling more than 106 inches of rain since the project started. Construction crews are working diligently to install the storm drainage system, which will be followed by road-widening work. Expect more barriers and lane closures as the storm boxes are installed and the road is completed. The Union Pacific Railroad bridge westbound lanes also are nearing completion as crews finalize the concrete pavement and curb. 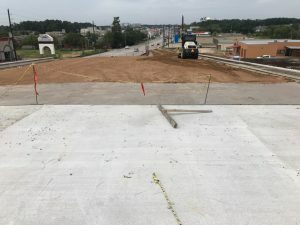 Looking west down onto Rayford Road from the UPRR Bridge. View from the ground looking up at the UPRR Bridge. 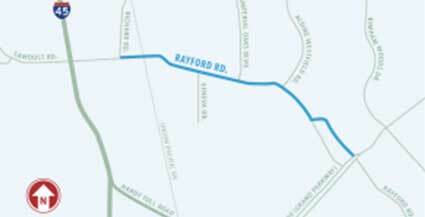 Residents and drivers can expect a full weekend closure of Rayford Road at Geneva Drive in the near future. This closure is necessary to install the large junction boxes connecting storm drainage on the north side of Rayford with the drainage on the south side of Rayford at Geneva, allowing the water to flow all the way to the outfall at Spring Creek. 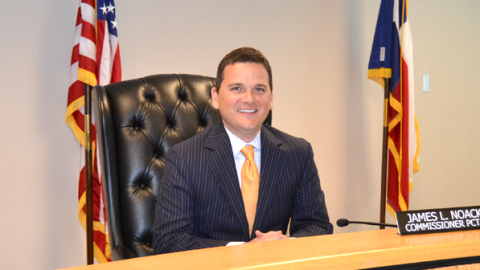 Our office will communicate the exact dates/times via social media, the Precinct 3 website and through signs along Rayford Road once those are confirmed. The work will commence, weather permitting, after a residential/commercial water line is relocated. 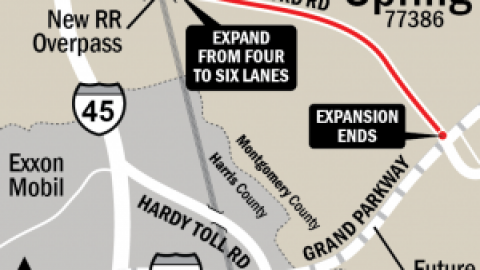 The closure will start on a Friday night and be completed before Monday morning. Please plan for alternative routes. A major challenge of this project has been the relocation of all utility lines running along the right of way next to the eastbound lanes. From phone to gas, water and electric, these lines have been moved one by one, and these companies will not start relocation until dirt is being turned on a project. The concrete barriers along Rayford Road have been in place to protect these crews from the vehicle traffic. Crews currently are working between East Hawthorne and West Hawthorne installing storm drainage pipes. 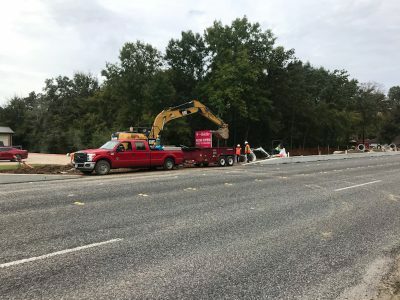 The outside westbound lane on Rayford Road is closed from the UPRR to Geneva Drive in order for crews to place concrete barriers as they install 1,900 linear feet of concrete boxes for drainage along the westbound side of the road. There are still two open lanes of traffic in each direction. The installation of the box culverts is anticipated to take a minimum of six weeks. 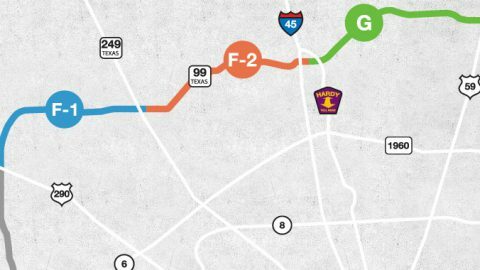 Once the box culverts are installed, Rayford Road will be widened on the westbound side. 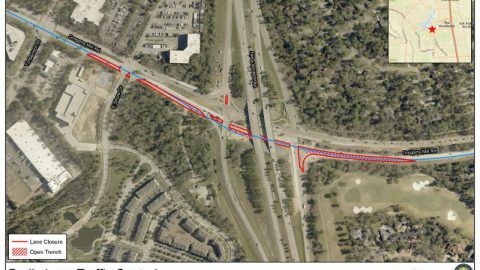 Eastbound and westbound temporary lane closures will occur from Richards Road to the Grand Parkway, from 9 a.m. to 3 p.m. Monday through Friday for the duration of the project (there may be some Saturday lane closures for utility work). Thank you for your patience while construction crews continue to work as quickly and safely as possible. We recognize that construction can cause inconveniences, and we appreciate your understanding during this process. Please follow all road signs, pay attention to barriers and watch for crew members in the right of way. Plan ahead, stay alert and drive safely! 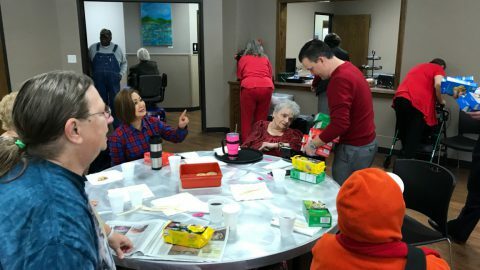 Sign up for email updates here, and please direct questions regarding the project via email to Rayford.Road@MCTX.org or phone at (281) 624-6326.